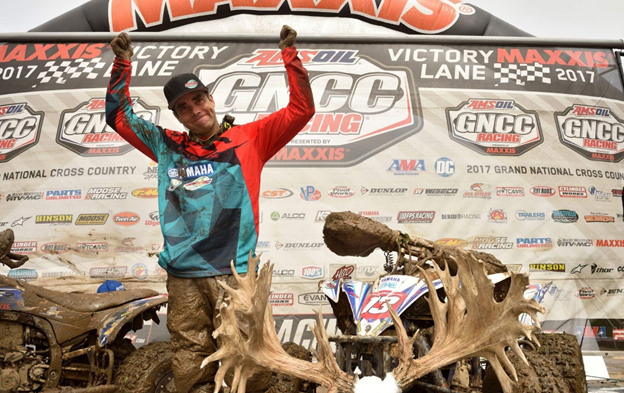 Round 6 of the GNCC was underway in Indiana, as top racers from across the country prepared to face off on the muddy tracks of Peru. GBC Motorsports’ own Johnny Gallagher pulled into starting position poised and focused, in anticipation of the race ahead. The XC1 Pro event was comprised of top racers from across the nation, all looking for a chance to stand in the number 1 slot on the podium. Yet, at the end of those 2 grueling laps amongst vicious competition, there would only be one to claim the crown. His name is Johnny Gallagher. Pro racer Jonny Gallagher is no stranger to the rise and falls of XC racing, and has seen his share of both highs and lows during his extensive racing career. Gallagher has been a part of the GBC Motorsports family since early 2009, and has always been a driven and determined racer. We have witnessed his transformation over the years, and have been privy to some of his greatest moments. We have followed and documented his racing career over the years, and have been on the front lines of some of his most intense battles.Gallagher has showcased his talents and abilities to prove he deserves a spot in the league of extraordinary racers. We have shared a growing and supportive relationship with Gallagher over the years, and we share in his moment with raised hands and champagne glasses. A true champion with countless races under his belt, Johnny has shown us that through perseverance and determination, victory is obtained. 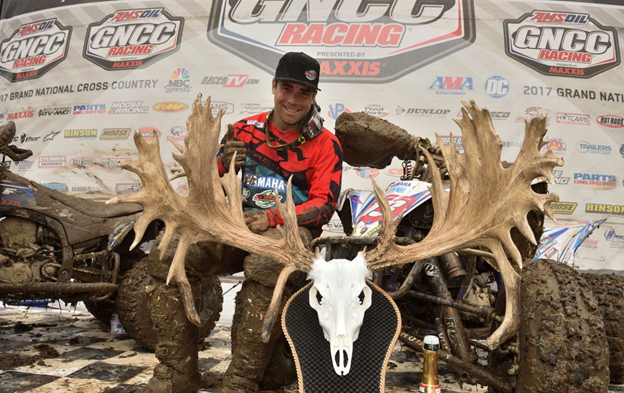 A true racer to the core, Gallagher has participated and dominated in events across the nation, but had yet to secure an overall top finish at GNCC. It was the motivation behind that uncaptured victory which catapulted him to the head of the pack and drove him towards the finish line. “When you’re out there among the other racers in the thick of things, anything can happened at any time,” Gallagher later said in an interview. At the start of the race, it was an intense battle for position and placement, as racers sped towards the hole shot. “I knew it would be a tough race,” said Gallagher, as he and fellow racer Walker Fowler faced off in spectacular fashion. Gallagher would fall behind after making a brief stop for goggles to cover his mud soaked face. After receiving his equipment, he pulled back onto the course, hammered down, and once again pursued his goal.